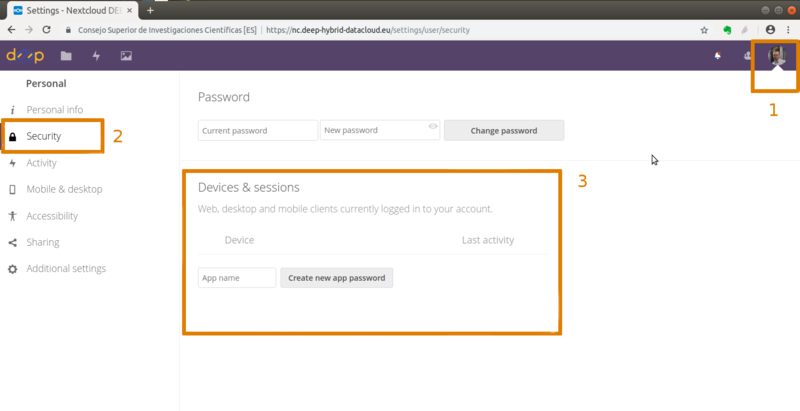 After login into DEEP-Nextcloud with your DEEP-IAM credentials, go to (1) Settings (top right corner) → (2) Security → (3) Devices & sessions. Set a name for you application and clik on Create new app password. That user and password is what one needs to include in the rclone config file (rclone.conf) to run locally or in the orchent script to generate the deployment when running remotely (see here and here). choose "n"  for "New remote"
specify "user" (see "Nextcloud configuration for rclone" above). Your username starts with "DEEP-IAM-..."
specify password (see "Nextcloud configuration for rclone" above). i.e. you mount rclone.conf file itself directly as a volume. More advanced usage includes calling rclone with various options (ls, copy, check) in order to check file existence at Source, check if after copying two versions match exactly.